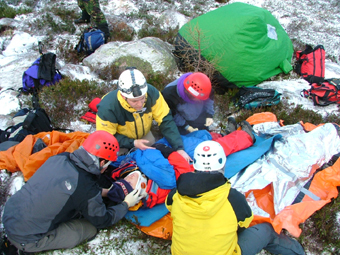 Wilderness Emergency Medical Institute Services, or WEMSI-International, is an educational organisation committed to improving standards in wilderness medical care. WEMSI-International has a broad range of expertise and works across the spectrum from medical aspects of technical Search and Rescue to expedition 'primary care', and from the First Responder to the rescue paramedic or doctor. They work in all environments from the hottest desert to coldest ice cap, and from the highest mountains to deepest cave. The work of WEMSI-International is voluntary, but their staff are all professionals and most work both in the wilderness and in medical provision in a professional capacity. Their faculty are all practitioners as well as trainers. Many of our Climbmedic staff are members of the WEMSI-International faculty (read meet the team) with other members of the climbmedic faculty having completed WEMSI training. WEMSI deliver a number of these courses yearly whilst also providing programmes tailored to specific groups, e.g. rescue teams, military units and expeditions. One of their goals is to develop trainers and training faculties. They do this through long-term relationships with organisations that are committed to developing in-house training solutions. Courses for practitioners are currently delivered in Scotland and Ireland.